My friend Alec celebrated his 50th birthday in January. 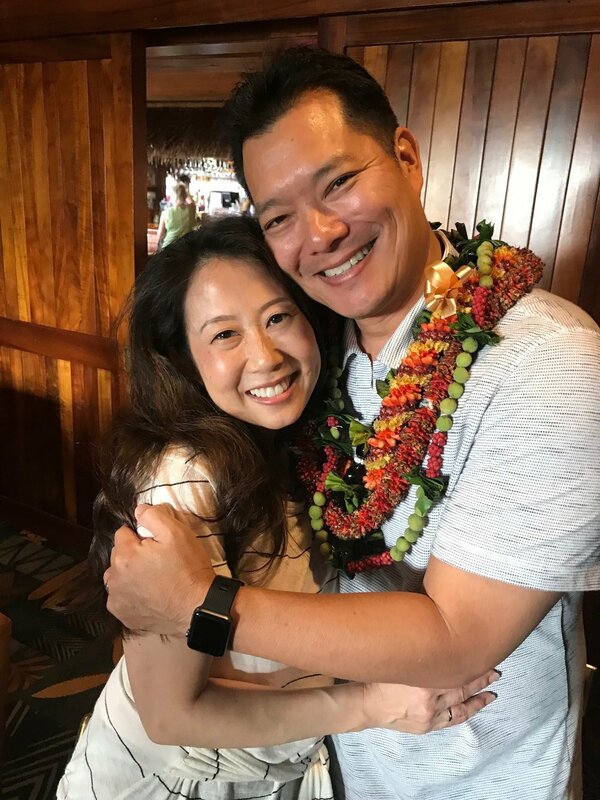 Since Alec loves to surf, his wife Lynne threw a surf themed surprise party for him at Duke’s in Waikiki. Creating a card for Alec gave me the opportunity to dig into my retired stamps and use two oldies but goodies. 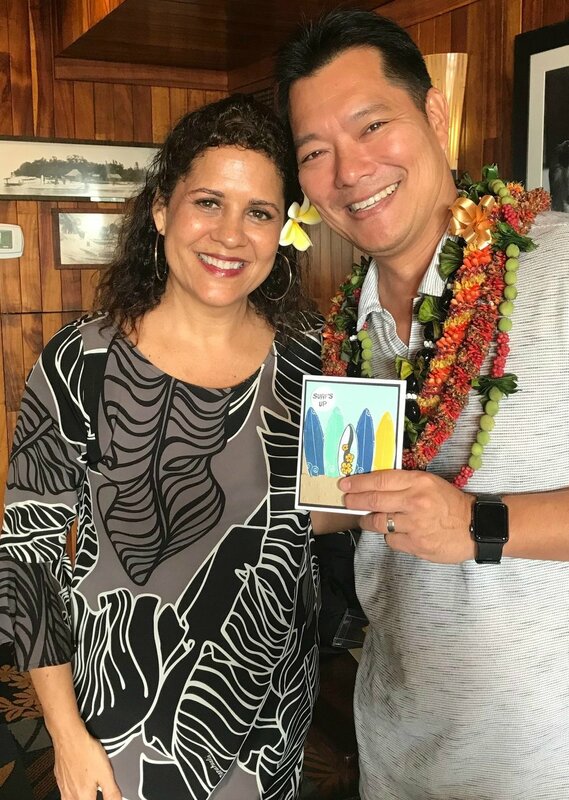 I used Surf’s Up and Do the Hula to create this card. The sand was created with Crumb Cake Card Stock that I ran through the Big Shot with the Sequins Textured Impressions Folder. After I ran the card stock through the Big Shot, I tore it with my hands so that the torn edge would look more like sand. I did two layers like this so I could position the surfboards in between the layers of “sand”. The large boards were made with the Surf’s Up stamp set and the small board with flowers on it comes from Do The Hula. I textured the background to look like water using the Seaside Textured Impressions folder. 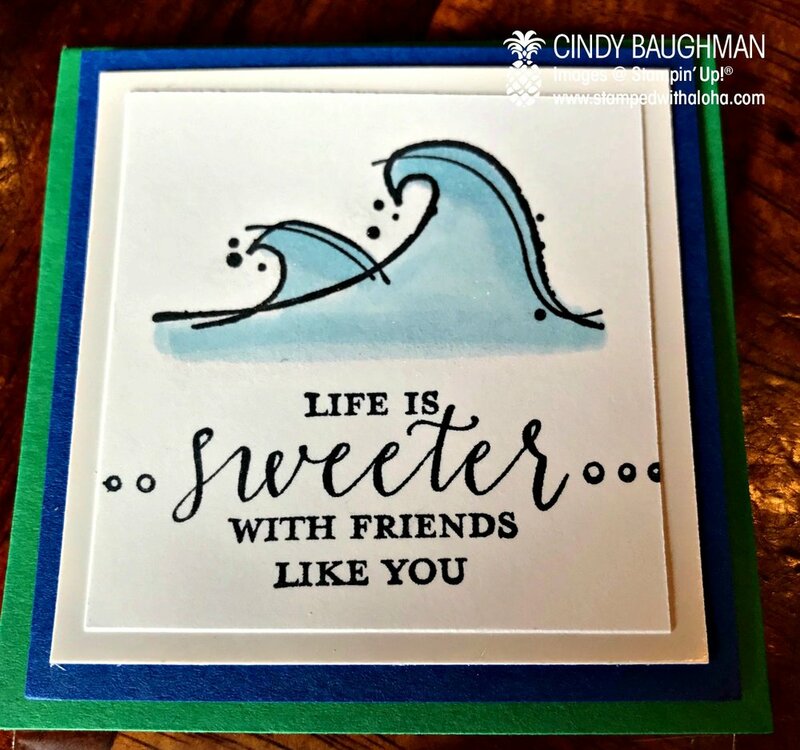 The sentiment “surf’s up” comes from the retired Surf’s Up stamp set. When you look inside the card you will see that this is actually a recordable card, another vintage Stampin’ Up! product. I just happen to have a few of these left over from many years ago. I sang a funny version of the song “Surf” and recorded it inside Alec’s card. Alec has a funny memory from when he once heard this song, so I tried to recapture that moment to make him smile on his special day. When I played the card for Lynne she laughed and told me how much she knew Alec would love this card. And as you can see, it did make him smile!! In addition to stamping him this card, I also stamped some toppers for the party favors. The toppers looked like this. The wave was from the retired set Surf’s Up and the sentiment “Life is Sweeter with Friends like you” comes from a current set called Detailed With Love. 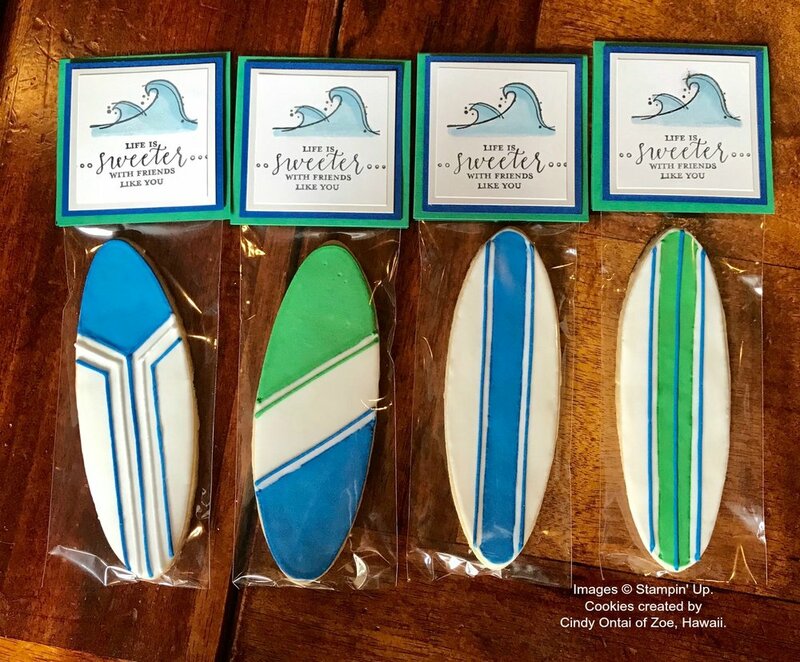 My extremely gifted and talented friend Cindy of Zoe, Hawaii, created the most adorable Surf Board cookies! Here is how they looked after we added the hand stamped topper. Cindy decorated the cake with 4 of her beautiful cookies. Just look at all the creative designs she came up with. Her cookies are not only beautiful but they taste so good too. Cindy cut up the cake so that everyone could take a piece home. We didn’t eat cake at the party because we had Hula Pie instead. Hula pie is a yummy mud pie dessert that is a must have when you are at Duke’s. Alec is like a brother to me. We have been really close friends for many years and I feel so grateful to have he and his family in my life. I know that he is not one to want a lot of attention so I think Lynne did a fabulous job planning a small intimate gathering of family and a few close friends to celebrate him on this very special birthday. I captured this impromptu moment where Alec gave Lynne a big hug. I know he was really thankful for all the hard work she did to bless him on his special day. I am glad that Alec celebrated his 50th birthday knowing how much he was loved and appreciated. It was a blessing to be a part of his special celebration.